Spars: Carbon masts w/2-spreaders swept 20 degrees; Carbon booms and gaffs. The hull shell is a light weight, high tech ‘wood sandwich’. The inside and outside skins are both carefully optimized laminates of ‘E-glass’ cloth and unidirectionals, combined with epoxy resins and Western Red Cedar veneers, all bonded to a core of CoreCell foam. The stem is solid cedar, the stem knuckle is heavily reinforced with additional ‘E-glass’ and wood veneers. The hull over the keel is solid glass, and there is a ‘belly pan’ of bi-axial ‘E-glass’ over the bottom amidships. 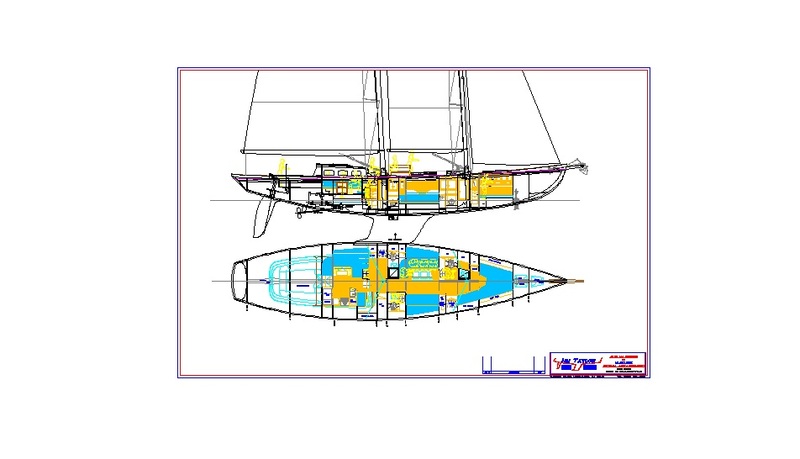 The keel loads are further supported and distributed by a sophisticated composite structure of integrated keel floors and longitudinals, all bonded to structural bulkheads and berth faces. The composite chainplates are fabricated of unidirectional carbon fiber, bonded to a locally reinforced area of the inner skin. The interior panels are ‘E-glass’ and foam core composites, bonded with biaxial ‘E-glass’ tape to the adjacent hull and deck surfaces. All of the laminations are vacuum-bagged and post-cured. This is a high tech, contemporary design that evokes, but does not mimic, an earlier era. Above the waterline, the long, sweeping sheerline, classic stem profile, and small ‘tumblehome’ transom all reflect a focus on classic fisherman schooner style. At the same time, below the waterline and above the sheerline, the focus is on combining lively performance with good sea manners, via hull, rig, and appendage detailing that has been carefully developed over long experience managing these tradeoffs. The light weight construction allows a high ballast/displacement ratio, and combined with a carbon rig, it provides ample stability to support a generous sailplan. A self-tacking jib, a ‘socked’ asymmetrical spinnaker, and modern, sophisticated deck hardware allow a small crew to handle this big power with confidence. The jib furler is located below to keep the deck clear and the look clean. She is intended primarily as a daysailor, so the focus is on an especially roomy and comfortable cockpit. Her interior is intended to be simple and practical, finished in a classic ‘Herreshoff’ style, trimmed with cherry brightwork. Her long sailing length and modest beam will make for a nice, easy motion upwind in a seaway, and she will stretch her long overhang legs in total control cracked off and downwind. Her unusual combination of classic style with contemporary performance will set her apart from (and usually far ahead of!) everything else on the water. We have a great tradition in North America of sailing fishing boats. In the Pacific Northwest we have the noble halibut schooners with their tall, plumb stems plunging to deep forefoots and very long keels. Their strong sheerlines are finished in fantail sterns and several of these big old beauties are still seeing active fishing service in Alaska. But on the East Coast you can’t beat the tradition of the Gloucester schooners that fished the Grand Banks. You could argue that these mighty schooners are the forerunners of the modern yacht. I like this design. 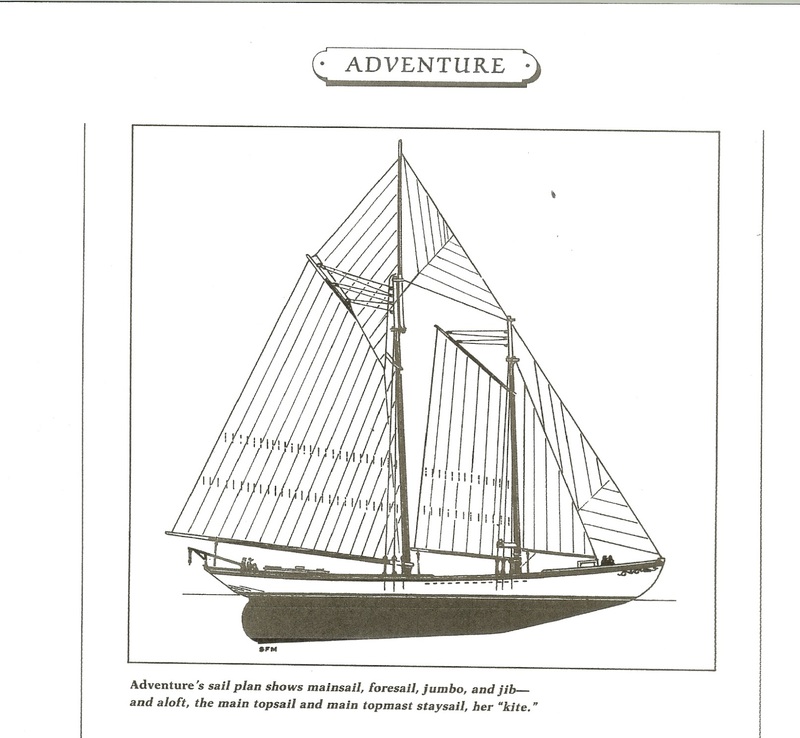 Jim Taylor, the designer of this schooner, loves this design. It represents a real break from his high-performance racing boats and stock racer-cruisers. He’s a very good designer and a lucky man to have landed a client with an eye for something very different. This boat is a hybrid, combining very traditional topsides with a thoroughly modern underbody. I’d call it a wolf in sheep’s clothing. 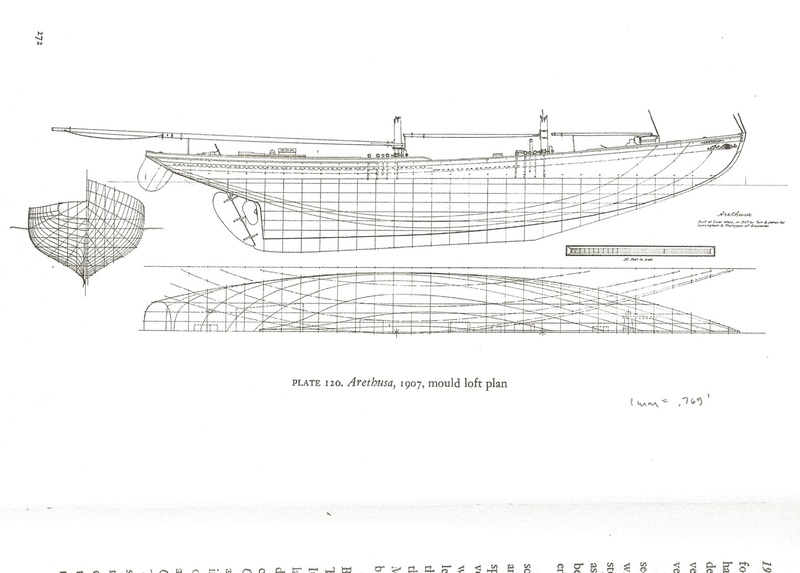 The skifflike hull form shows arclike sections and a D/L of 190. Jim introduces some tumblehome just before the transom to ensure a pretty transom shape. It’s a narrow boat with an L/B of 4.26. The overhangs are long but they have to be in order to carry off this look. I like the knuckle in the bow profile. This design started with less LOA, but in order to keep a flush-deck look while retaining headroom below Jim added 8 feet to the LOA to keep the balance of freeboard to LOA eye sweet. Draft is 9 feet and the rudder is a spade type. Originally, the owner was not too concerned about the layout, as he did not imagine spending nights aboard the boat. But the layout grew to include two sleeping cabins, three heads and a raised pilothouse with dinette and galley. There is even a nav station forward of the galley in the pilothouse, but I don’t see anything to indicate inside steering other than by autopilot. This pilothouse will make a dandy place to hang out in rainy weather. The dinette is raised up a step so visibility from the dinette will be unobstructed. I like to raise dinettes two steps to put the seated guests’ eyes right in the middle of the window. What a great-looking boat. It has lots of little boxes on the deck including a big butterfly skylight to give it that traditional look. The knockabout schooner rig is all carbon fiber to save weight. The topsails stow into the masts so they can be very easily deployed. If you think of those big carbon gaffs as just oversized battens this rig is really similar to the current trend in “fat-head” mains. With an SA/D of 24.57 it looks like a lot of rig to handle, but the jib is self-tacking to a track on the foredeck and tacking this boat will be a hands-off maneuver. Note that the spreaders are swept 28 degrees. A standing backstay is out of the question with that big mainsail. Running backstays will be used from time to time to keep everything optimized for performance. 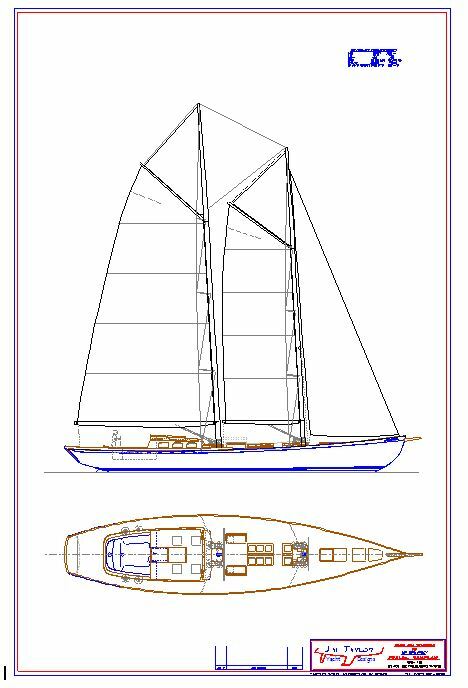 Covey Island Boatworks in Nova Scotia will build this schooner and it is great at this type of design. The hull will be cold-molded Alaska Yellow Cedar skins over 30-millimeter CoreCell foam. This will be reinforced with E-glass cloth and unidirectional glass layers. Keel, floors and maststeps are laminated mahogany. The chainplates are carbon fiber. The deck is constructed similar to that of the hull with wood skins over a CoreCell core, a teak overlay then is applied for the right look and durability. All laminations are vacuum bagged and post-cured to an elevated temperature. A 135-horsepower Perkins will push the boat along in the light stuff and a bow thruster will make the skipper look like a hero around the dock. There is tankage for 150 gallons of fuel and 250 gallons of water. Going below on a blustery night, I don’t think you are going to find Lionel Barrymore, Spencer Tracy and John Carradine sitting round the dinette smoking their pipes and enjoying their drams. Too damn bad. This is not your grandpa’s schooner. This is a thoroughly modern interpretation of a classic theme. This design is about half the length of the Gloucester schooners, but to my eye it more than does justice to the tradition. LOA 68’2″; LWL 52’2″; Beam 16′; Draft 9′; Displacement 60,580 lbs. ; Ballast 29,930 lbs. ; Sail area 2,369 sq. ft.; SA/D 24.57; D/L 190; L/B 4.26; Auxiliary Perkins M135 135-hp; Fuel 150 gals. ; Water 250 gals. Designer: Jim Taylor Yacht Designs, 67 B Front St., Marblehead, MA 01945, (781) 631-6235,www.tayloryachtdesigns.com.